As we enter the hot days of August, our gardens can begin to look a bit tired. The heat and drier conditions mean that the flowers of spring and early summer have faded, and often there is little color to be seen. Smart gardeners plan for this, and make sure they grow some plants that will carry on through the heat and drought, brightening the garden exactly when we want to be out in it most, enjoying barbeques and relaxing. So what to grow? If you are a keen gardener, or someone who wants lots of color from plants that are easy to grow, the Butterfly Bush has lots to offer. These deciduous shrubs adore hot conditions, and they give their best at the peak of summer. They are very easy to grow, and they thrive in almost any soil. They love the sun, and dry conditions don’t bother them at all – in fact they do best in well-drained to dry soil. Under these conditions they bloom continuously – and what blooms! The long spikes of flowers can be 6 or 8 inches long, packed with tiny blooms in vibrant shades of purple, blue, red or pink – all perfect colors to stand out in full sun. There is one more feature too, perhaps their most significant, and that is a rich, honey fragrance that flows from the flowers and drifts across the garden. This fragrance intoxicates butterflies and other nectar-eating insects, who flock to the plants, which of course is why they are called Butterfly Bushes. If you have small children or grand-children, the delight in their eyes at this fluttering horde, including all kinds of butterflies, common and rare, makes the Butterfly Bush worth growing for that alone. But as we have already pointed out, it has many other virtues. In recent years these plants have received some bad press, so let’s consider this. In some parts of the country, especially in the north-west, the easy-growing Butterfly Bush has become a pest, spreading into natural areas and interfering with their delicate ecology. Some people have stopped growing this plant, and in some states it is even illegal to do so. In other parts of the country there is no problem, especially in the colder north-east, where the cold winters prevent seed germination, although the plants themselves will survive. In response, plant breeders at several universities have worked to produce non-seeding (sterile) varieties – and they have succeeded. So the first thing to consider, when deciding to grow these plants – and you really should if you want easy summer color and the joy of butterflies around your garden – is if it is a local problem or not. A little research, and enquiry will soon answer that for you. Gardeners in colder areas usually have nothing to worry about. If it is not a local problem, you can grow the traditional varieties. If it is a problem, then switch to one of the newer types. We will look at some examples of both a little lower down. 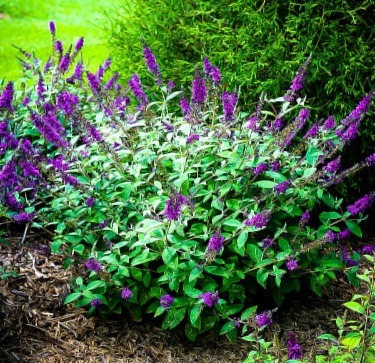 Choose a sunny spot in well-drained soil to plant your Butterfly Bush. Add some organic material such as well-rotted garden compost, or animal manure, to the soil, along with some bone-meal or superphosphate. Water your new plant regularly for the first few weeks, but once it has become established it is drought-resistant, and older plants need very little extra water. Pests and diseases are not a problem, and the secret to success with this easy plant lies in pruning and trimming. Butterfly Bushes grow well everywhere from zone 5 to zone 9. In colder areas some of the branches will die-back over winter, but no worries, as the plants re-sprout from the base, and grow rapidly. They will soon be blooming again. In those cold areas pruning is very easy. Simply wait until you see new shoots in late spring, and then remove all the parts that are not sprouting. In zones 6 and warmer, most of the top growth with still be alive in spring. Again, pruning is easy. Remove all the weak, twiggy shoots, leaving an open framework of the strongest branches. With an older bush, remove one or two of the oldest branches completely each year, cutting back to just a few inches above the ground. This will encourage strong renewal of your plant. Finish by shortening back the shoots by about ⅓. Always cut just above a pair of new shoots. Once your bushes start to bloom, each cluster of blooms lasts for a week or so. Once it fades, cut it off just above the first pair of leaves below it. This does two things. It encourages more flowers to form, keeping your bush blooming constantly. It also removes any possibility of seed being produced, so where ever you are, your plant cannot escape into the wild. It’s that simple. Let’s finish by looking at some varieties that are top-choices for your garden. First, some traditional types, for gardens where escape is not an issue, or you are very careful with removing old flowers before they form seeds. Then some new, sterile varieties, that can be grown anywhere at all, with no fear of their escaping into natural areas. Black Knight – This old favorite is well-known for its enormous flower spikes, which can be 8 inches long, and their rich deep-purple color. It grows 6 feet tall, or even more in warmer areas, and it is also hardy to zone 4, where it will be die back to the ground in winter. It re-sprouts easily, and then grows up to 5 feet tall in a single season. Royal Red – Another larger bush, this one will grow in zone 4 too, and it has large dee-red flower spikes. In warmer areas it can reach 8 feet in height, so allow enough room for this spectacular plant. Pink Delight – Make a bright planting by growing all three of these varieties, as this one will add a brighter and lighter pink to the mix. It also grows up to 6 feet tall, and really stands out with its delicious coloring. Miss Molly – This plant boasts beautiful large sprays of flowers in a rich fuchsia-pink. It grows 4 to 5 feet tall, and as much across, so it fits perfectly at the back of a bed, behind lower shrubs or annual flowers. Miss Ruby – Similar in size and form to ‘Miss Molly’, this easy-to-grow plant has 4-inch flower spikes in the richest red, glowing like jewels in the sun. Nanho Blue – This sterile variety has the largest flower-spikes of all, 8 to even 10 inches long. Their gorgeous coloring of mauve blue looks elegant against the silver-grey foliage. Asian Moon – This is another large-bloom variety, with rich purple flower clusters on a plant that grows 5 to 7 feet tall. It really makes an impact. Lo & Behold® – Not a single plant, but a range of plants different from most of the others, this group comes in several shades, including pink and blue. These plants grow only to about 3 feet tall, so they are ideal for smaller gardens. The flowers spikes are densely packed with blooms, but smaller too, only a few inches long. They make up for that by being produced in a profusion month after month. What is the price of the Butterfly bush? I am looking to start a flower garden. This is my first time attempting to create a garden of various flowers. Please let me know if you carry other perennials besides the butterfly bush. You can see all our butterfly bushes on our site by clicking on the link. We have many other flowering shrubs, look under the’Shrubs and Hedges’ section. An interesting way to make a flower garden is to use these flowering shrubs blended with ornamental grasses. Good luck with your flower garden!